Bugs and glitches are an unfortunate fact of life that usually just have to be tolerated when playing a game as hugely popular as League of Legends. The story of one such bug that's teetered between irritating and insufferable got a lot more interesting this week after a player figured out how to reproduce it. The bug in question affects Nidalee, a popular champion who's already been a hot topic of debate amongst League players for a while since she's currently so powerful that people go back and forth incessantly about whether or not she's due for some sort of rework or nerf. One of the main things that makes her such a formidable (and therefore often irritating) character to go against in League is her special attack known as "Javelin Toss." 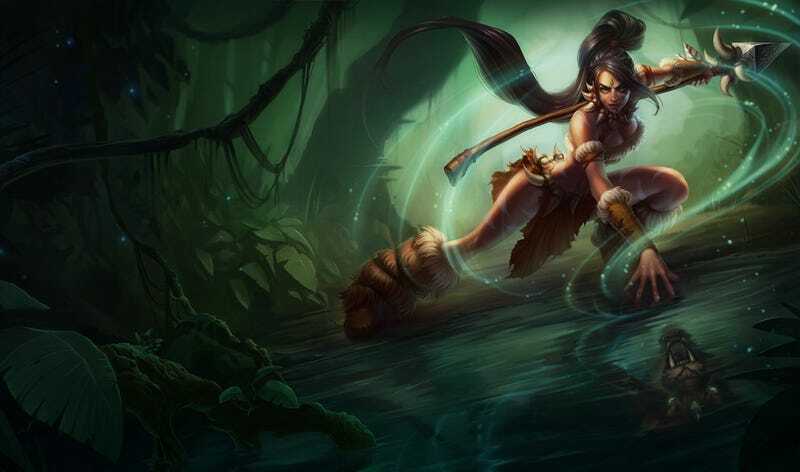 As the name suggests, the attack involves Nidalee hurling her spear at an enemy. While it can be dodged, the spear takes away a substantial chunk of a target's health bar if it isn't. The technical issue, commonly referred to as Nidalee's "invisible spear bug," renders her javelin, well, invisible right after she throws it using her special attack. If it's invisible, it's obviously much more difficult—if not impossible—to dodge. Given how competitive the climate of League of Legends is, Nidalee's invisible spear bug has sparked calls from fans for Riot to disable the champion until the bug is resolved. She actually was suspended as a playable champion at one point late last year, but for a separate and unrelated technical issue. The invisible spear bug, on the other hand, has remained as one of those intermittent annoying-but-not-quite-game-breaking issues because it never seemed to appear often enough to warrant anything as drastic as pulling her out of the game. Much like, say, an oft-recurring bug in one of the game's popular sets of armor, invisible Nidalee spears just seemed like one of those things that'd crop up from time to time. Players would just have to wait it out when it does. This week, one player who goes by the handle "FLASHnFUSE" on YouTube posted on the League of Legends forums showing how he'd managed to reproduce the invisible spear bug twice in a row using a technique he'd come up with by repeated trial and error. I reproduced this several times in an empty custom game (and a full of beginner bots custom game). I didn't record until I thought I could reproduce it easily and spent another 3 minutes until I reproduced the bug twice in a row. What I did to do this bug: first thing I did was swap the attack move click to right click instead of shift-right click. Made things easier. -throw a spear at the very end of a wind up animation, when the attack has technically "left" Nidalee. -the auto attack will connect with the minion (or tower, which tends to be easier to reproduce the bug at simply because of the longevity of a tower) and as the missile from the auto attack disappears, so will the nidalee spear. The timing window for this bug is INCREDIBLY narrow, but the spear from Nidalee's Q disappears when the projectile from her auto attack hits a minion and disappears. The times this bug successfully recreates, the spear from Nidalee's Q disappears as the auto attack damage is counted, but if you miss the timing on reproducing this bug you will not auto attack until well after you've thrown the spear. I think this bug's source is something to do with the client's disposal of projectiles. Given how seriously League of Legends players take the game's competition, I find it hard to believe that the community would stand for it if players started winning games with the help of any exploit—let alone one as cheap as an invisible attack. Regardless, it will be interesting to see how this plays out now more of the science behind one of Nidalee's most ubiquitous issues has been laid out for more players to see.